How can I find specific information about one of your products, such as it’s Ingredients or Recomended Use? Product Information: an overview of the product’s research, benefits, purpose, and references. Product Label: a printable product’s label, which details the product’s count, contents (per serving), and recomended serving size. Product FAQs: product specific Frequently Asked Questions. Is there a quick way for me to locate a specific product on this website? By Product Name use this option located in the All Products Page and type the product name to filter the exact product you seek. By Health Category select the Health Category that best applies to reduce the number of avilable products to look through. By Web Search: This option returns Google Search Results for the product on the site. I tried the product search options listed above and I still cannot find what I’m looking for. What other options are available? It’s possible that the product you seek is discontinued, was only available for a limited time, or out of stock. Please Contact US and we will determine if the product available or not. If so, then we will facilitate your order on the phone! The website shows that the specific product I want to purchase is out of stock or on backorder. I would still like to purchase the product and have it shipped to me when it is available again. What can I do to make this happen? We are very sorry for this inconveience. Please feel free to Contact US and we will try to get your product out to you just as soon as it is available! How do I know when my product expires? TriVita product labels adhere to FDA (21CFR111) guidelines to ensure efficacy, safety, freshness and ingredient disclosure. All product labels list the manufacture date rather than the expiration date to supply customers with the most recent manufactured products. All TriVita powders, tablets and capsules come with a two-year shelf-life from time of manufacture date listed on the label. TriVita liquid products come with a one-year shelf-life from time of manufacture date listed on the label. I only have an account number, not a customer ID. Are they the same? Yes, they are the same. When asked for a customer ID, enter your account number and continue as prompted. All customer orders received are audited for quality assurance and will be processed and shipped the following business day. Once shipped, you should expect to receive your order within 7-10 business days. All customer orders received are audited for quality assurance and will be processed and shipped the following business day. Once shipped, you should expect to receive your order within 2 business days. All customer orders received are audited for quality assurance and will be processed and shipped the following business day. Once shipped, you should expect to receive your order the next business day. How can I change my shipping and/or billing address? You can change your address online during the checkout process. If you recently placed an order and wish to change the destination address, please call Member Services at 1-877-850-2968. Yes, we have a 60 day money back guarantee. If you are not fully satisfied with your purchase, return the unused portion within 60 days of the purchase date and you will receive a full refund less shipping or an equivalent exchange/account credit — your preference. Contact TriVita Member Services at 1-877-850-2968 or memberservice@trivita.com to request a Return Authorization Number. How can I become a TriVita member? When you purchase a single product, you become a lifetime TriVita Member. This is the next level of TriVita membership. Premier Members receive exclusive rewards, special offers, priority customer service and more. There are no fees or obligations for membership—just added benefits. Call 1-800-991-7116 or visit TriVita.com to enroll. What are the benefits of Premier Membership? Enjoy VitaPoints equal to 4% of the product value of ALL your purchases. Use your VitaPoints at any time for TriVita products and TriVita Wellness Center services. Refer friends and family members to TriVita and earn 20% of the product value of their orders—not just once, but every time they order! Use your VitaPoints at any time for TriVita products and TriVita Wellness Center services. Receive special offers and gifts. As a Premier Member, you’re also eligible for exclusive offers and access to extra VitaPoints on specially selected items. Your satisfaction is our top priority. If you have questions or concerns, we have reserved a toll-free number for Premier Members only. A Wellness Consultant is standing by to take your call. How do I redeem my VitaPoints? You can use your VitaPoints as soon as you earn them; no waiting. You can also let them accrue for that special purchase or service that you want; however, make sure you use your points within a 12-month window. No points can be carried more than 12 months. To redeem for products: When placing an order on TriVita.com, use your points towards your purchase in your cart before you complete the checkout process. VitaPoints cannot be applied to shipping, handling, or taxes. 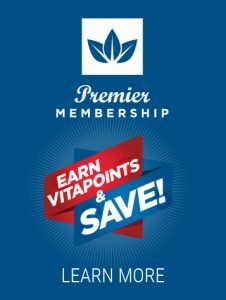 To redeem for Wellness Center services: Premier Members can also use their VitaPoints to purchase Wellness Center gift certificates in $25 denominations with your VitaPoints. How can I find out how many VitaPoints I have? Go to TriVita.com and click on My Account. Call Premier Member customer service. Check your latest TriVita invoice. Can TriVita answer my health and medical questions? Health and medical questions should be directed to your healthcare professional. Information provided by TriVita is for informational purposes only and is not intended as a substitute for advice from your physician and/or other healthcare professional. You should not use this information for diagnosis or treatment of any medical conditions or for prescription of any treatment. For more information on TriVita products and what they can do for you, please contact a Wellness Consultant at 1-800-991-7116. Although they do not give medical advice, TriVita’s Wellness Consultants are highly trained and can help recommend what products and/or services might best fit your needs.